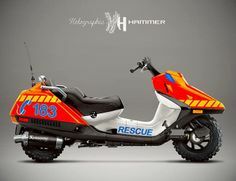 Scooter Community, Everything about Scooters, Join the Scooter Community » SOCIAL » Maxi Chat - Talk about maxi scooters » I just fell In love with a Honda Helix. I just fell In love with a Honda Helix. Last post 12-15-2017 01:04 PM by pyrah. 29 replies. Bugger, it looked a lot like a Helix. The quest continues, even for another bike that has that retro look. thanks for the heads up about that bike ! If anyone sees a classic weirdo scooter for sale in Australia let me know if possible, thanks. No problem. Shame the Ad was still up. Oh well, the search continues. I'm very grateful for the information, it could have been the start of something great. I'm on a Honda Scoopy 50cc at the moment, its good to ride,great for reliability, but it's not suitable to take out of suburban streets, it's got a top speed of 50 and that's going downhill with a following breeze ! I'm STILL on the hunt for a Helix in Sydney. I bought a great Italjet 180 cc that's was like lightening fast and a bit scary due to its lack of contact with the Tarmac at speed. And more recently I bought a 1982 Honda Lead 2-stroke that a big chunky but very reliable girl that get me around town. Has anyone bored of their incredible Helix machine and looking to sell it into a good home ? I have only ever sighted one Helix. This was whilst riding my little Cannondale Hooligan in the back lane behind the shops that front Campbell Pde Bondi only several months ago. If I find myself down there again soon I will investigate. It is not a scooter easily confused with any other. What a conversation starter. I saw my first one in traffic and I stalked the guy for a few kms until I caught up. It was modded and looked like a flying upholstered lounge. When I find a decent one I'll definitely share it here, but if you know of one for sale please let me know. Yes, the Helix is truly hideous...BUT strangely attractive....all those 80's angles! Some of the customs look great. I had a look at a few Spaceys but they were a bit hammered. I got an 82' Honda Lead with 1000kms on the clock recently and it's great but I've moved jobs and need a bigger engine. If there was a decent condition Spacey I would snap it up while waiting for that Helix to appear. Know anyone with a good Spacey for sale ? The Honda Ch 250 Spacy was my first scooter. It wasn't new, but had very low ks. It was a bargain. I stopped using with any frequency my BMW Roadster motorbike when the Spacy came along. Just loved the fun element, the great motor and fluid drive. Then purchased a new Yammy YP 250 Majesty at a great price. Ran the two scooters side by side, but for different applications. Said goodbye to the BMW, which I was never going to sell, and ran the Majesty down the coast on B roads, with the Spacy used for urban duties. The thing with these two scooters is that they would have both been produced in Japan, I believe, with their quality and reliability offering great pleasure. I do see the odd rare Spacy doing its stuff, but you could only really consider it for town duties. They do look funky. They looked funky back then. A real little Q Ship at the traffic lights. The Majesty is a more common beast comparatively, but some of them now have big mileage. I was comfortable on the M out of town. The little Dio is my 10th Honda. I find it difficult to move away from Japanese quality and reliability, particularly after my Aprilia experience. Yep, you can now purchase reasonably from an array of capable small capacity motorbikes, motorbikes that can make some scooters appear as expensive. But scooters have their own appeal, as I discovered, for which unfortuneately you pay a premium. I just wish we had more great scoots under 300cc from which to make choices. I’ve spotted another Helix in Manly, 2095, but it’s not the Helix it’s a Spazio which may be one and the same as the Helix but this one is white, low and sleek without all the accoutrements. It’s was a bit hammered but still lovely to the eye. My wife is repulsed by its existence but if I had the presence of mind at the time I would have placed a note on it asking to buy it. Anyone know who owns the White Spazio in Manly or Northern Beaches ? There was a Helix for sale on Gumtree about 6-8 weeks ago. I was going to place you on notice, but thought that you were looking yourself. A quick look now identifies it as sold. It was modified though. Go to Honda Helix Gumtree - Images (web). It should be the one in the top left hand corner - dark colour with the ugly muffler. The white one I saw in the back streets of Bondi appeared original. Dang ! There was a Red one that an old guy tried to sell me but it didn’t have a compliance plate and it had the shite kicked out of it, so I passed. A few months later a young guy shows up with the same bike , this time With a compliance plate, and he says he’s owned it for 2 years. It had the same number plate, same damage and I even told him there was a road map in the back compartment and yes, there it was. So it’s the same bike but the scam was new. im certainly looking for a Helix that’s not dead so any links are most welcome. Thanks guys ! !